Following a highly successful debut to the world’s media earlier this year, Rolls-Royce has finally released to the UK motor market the first Cullinans for patrons of this luxury British marque to experience. In total, just 8 Rolls Royce Cullinans left their home in Goodwood, West Sussex, in convoy at 1pm on Friday bound for the 8 different showrooms that embody the marque across throughout the UK. Following final sign off from Julian Jenkins, Regional Director, Rolls-Royce Motor Cars, the Cullinans were driven by representatives of the showroom to their new homes in Edinburgh, Leeds, Manchester, Birmingham, Bristol, Essex, London and Sunningdale, where they will continue to excite this metamorphic motor car’s existence as truly Effortless Everywhere. “Response to our new Rolls-Royce Cullinan from the world’s leading opinion formers and global media has been unequivocally positive and I am delighted that, from today, prospective clients will have the opportunity to experience this remarkable motor car via their local Rolls Royce showroom.” Rolls Royce. Rolls Royce believes that the super-luxury lifestyle is growing and they lead the race to be the best. Torsten Müller-Ötvös, Chief Executive Officer, Rolls-Royce Motor Cars said “Luxury is about embracing and experiencing the wider world. Our customers expect to go everywhere in luxury, effortlessly and without compromise, conquering the most challenging terrain to enjoy life’s most enriching experiences, wherever they may be. For this reason, they have asked us to create a Rolls-Royce that offers uncompromised luxury wherever they dare to venture. Cullinan is that car. It is Effortless, Everywhere. – The most anticipated Rolls Royce of 2018 and Rolls-Royce of all time. – Named after the largest diamond ever discovered which now resides in the British Crown Jewels. – An all-terrain high-bodied car that makes the idea of authentic, luxury off-road travel a reality. Luxury travel is now Effortless, Everywhere. – Combining contemporary with functional design ensures the Rolls Royce Cullinan obtains iconic status in the face of SUV competition. – The first “three-box” car in the SUV-sector. Cullinan’s rear partition wall creates a distinct environment for passengers, separated from the luggage compartment. 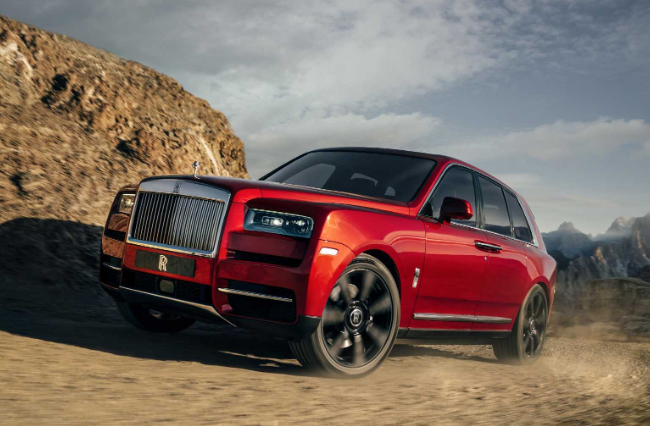 – A practical Rolls Royces, the Cullinan is a versatile, family oriented, fun-to-drive super-luxury SUV. – The second new Rolls-Royce to sit on the all-new aluminium ‘Architecture of Luxury’, Cullinan is the most technologically advanced..
– Tested to destruction the Cullinan is an incredibly capable off-road vehicle that sees the development of the ‘Magic Carpet Ride’ for off-road enjoyment, without sacrificing any Rolls-Royce on-road behaviour. – Cullinan offers a suite of Bespoke features developed specifically for the many various lifestyles of its owners including the Viewing Suite and the Recreation Module. – The 6.75 litre twin-turbo V12 Rolls-Royce engine delivers 563bhp/420kW and 850Nm/627lb ft of torque to the all-new all-wheel drive, all-wheel steer system needed to overcome any challenge.